At Keryluk Laser Dental, we love treating patients with Invisalign! Instead of using metal braces, Invisalign uses a series of clear and removable aligners that no one can tell you're wearing! Request a complimentary consultation with Dr. Glenn Keryluk or Dr. Susan Wacker today to see if Invisalign is right for you! Why would I want Invisalign at Keryluk Laser Dental? Not only are the aligners invisible, they are removable, so you can eat and drink what you want while in treatment. They are also comfortable, with no metal to cause mouth abrasions during treatment. And no metal and wires usually means you spend less time at Keryluk Laser Dental getting adjustments. Invisalign is made with very precise 3D computer imaging technology that also allows you to view your own virtual treatment plan when you start, so you can see how your straight teeth will look when your treatment is complete. Our office provides complimentary consultations without a referral. During your Invisalign consultation, we will outline the factors that will determine your treatment plan. Every Invisalign treatment is unique, so we take care to thoroughly evaluate your situation and provide you with an appropriate solution for your dental health concerns. Dr. Keryluk regularly attends educational courses and elite Invisalign summits to stay ahead of industry trends. You're in great hands at Keryluk Laser Dental! In addition, Keryluk Laser Dental can also provide you with the latest advancements in your dental care! If you need to improve other areas of your smile, we can combine Invisalign treatment options with veneers, teeth whitening, and crowns treatments. We even include six tubes of Zoom take-home whitening when you begin treatment! To make your experience as easy as possible in our office, we complete all insurance paperwork on your behalf to make your payment plan as simple as possible. We also offer interest-free financing with affordable monthly payments, pre-authorize your coverage and bill your insurance directly. You wear each set of aligners for about two weeks, removing them only during mealtimes and to brush and floss your teeth. The average course of treatment is about nine months and people usually wear between 18 and 30 aligners during treatment, but this will vary with the severity of your case and compliance. You'll come visit us at Keryluk Laser Dental here in Port Coquitlam each month to make sure your smile is progressing according to your Invisalign treatment plan. 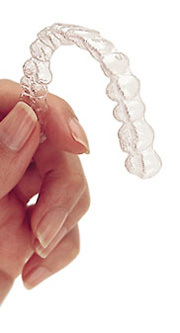 We also supply you with aligner chewies or retainer retrievers free of charge and help make the aligners easier to wear!